ever heard of Berliner Biermeile? the schwaben version is much more fat on the top and it does have a wite open knife blate withe line on the fat top part. and yes it taste different! The last (and first) time I tried making pretzels at home some looked like the upper picture, some looked like the lower picture, and some didn't look like pretzels at all. I gave the really bad ones to the dogs before anyone else saw them. Last edited by bridgman; 07-17-2011, 11:18 AM. 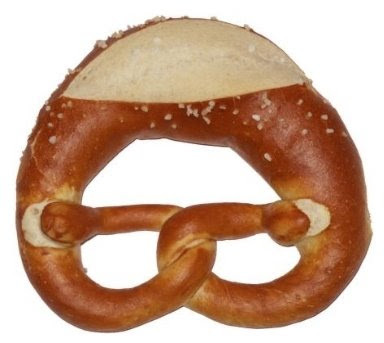 get 500 g of Wheat powder extra fine and dry yeast for 500g powder and now the cheat part get 100g of clean 100% gluten proteins and baking soda for 1kg powder you also need salt and high dangerous '''Natriumhydrogencarbonate''' the dangerous secret of the brezeln. !! !and do NOT ad the baking soda yet!!! then you ad the baking soda and knead it again now you cut it into 5 pieces and roll sausages and the mid need to be bigger than the ends you need 30-40cm sausages and now the magic trick of the brezeln make an downward '''U''' and Cross the ends like an '''X''' then the down end goes upper the other one and put it into the bigger part and then the other left up the X and put it into the bigger part. and now the high dangerous part you need to wear gloves and saver eye glasses put 2,5g of '''Natriumhydrogencarbonate''' into 50ml water and brush the brezeln. now you let the yast work again for 30 minutes and you need to heat up your oven up to 220C then you put the stuff into it! you need to wait 20-25 minutes ti finish your work. now you are a bakery Master! Its a general observation for pastry stuff and baking and also in many cases professional bakers use ingredients that are not easily available for the home cook. Apart from the ingredients there are things like environment temperature humidity etc that affect doughs. Also you have to be very precise in everything you do ie resting and proofing times oven temperatures and preparation (ie steaming) and many other things that the average cookbook doesn't describe properly. The same thing has happened at many of the Oktoberfest festivals in the USA - They more often resemble St. Patrick's Day than a German beer festival or German beer garden. I think nothing beats the Englischer Garten in the spring for the perfect biergarten experience. No, but that's during the Desktop Summit. Definitely going to check it out! "in many cases professional bakers use ingredients that are not easily available for the home cook. "